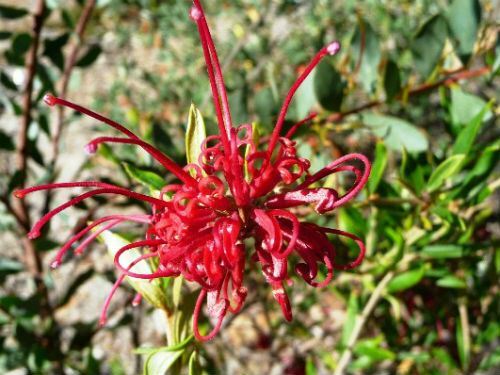 Grevillea speciosa is a small to medium shrub that may reach height of two metres. In our cold climate garden specimens reach a height of about one metre after three years in the ground. The leaves are narrow-lanceolate or elliptic, light to dark green and up to five centimetres long. Flowers are pink to bright red, held in clusters up to seven centimetres long and carried on the end of branches. They are both conspicuous and profuse. Some blooms are carried throughout the year with a peak in spring. Our plants have bright red flowers. The species appreciates light pruning. This keeps the plants dense and blooming bounteously. Grevillea speciosa is a beautiful shrub with eye-catching blooms. The species is confined to the Sydney area and is one of a huge range of interesting plants growing on soil derived from Hawkesbury Sandstone. We have admired this beautiful grevillea in the Brisbane Waters National Park near Gosford on the Central Coast of NSW. Grevillea speciosa is said to hybridise with Grevillea sericea and Grevillea oldei.